4-Hers and friends have been extending "congratulations" to Kaitlyn Kane for earning the privilege of representing Henderson County in the Illinois Farm Bureau Master Showmanship Contest. The contest will take place on Friday, August 8 in the Junior Livestock Barn on the Illinois State Fairgrounds. Kaitlyn is the daughter of Jim and Kim Kane of Smithshire, and a member of the Raritan Explorers 4-H Club. 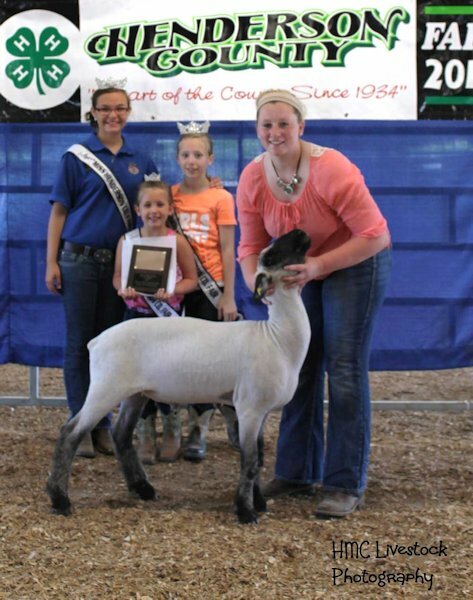 Kaitlyn earned the opportunity to compete at the Illinois State Fair for the title of Master Showman by competing against three fellow-4-H members at the Henderson County 4-H Shows over the course of three days, following the Sheep, Beef, and Swine shows. Contestants are required to be Henderson County 4-H members in good standing, and they are required to show each of those three species in the Master Showmanship class following each of the livestock shows. The contestants may or may not have been showing in those livestock shows earlier in the day. Other contestants this year were Mason Butler, J. C. Campbell, and Cassie Campbell, and each of them placed in the top two in at least one of the species. Only one master showman from each Illinois county is allowed to compete at the state contest, and we know Kaitlyn will represent Henderson County well!